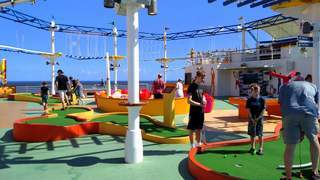 Carnival Cruise Line is well known for its fun ships. One of their slogans is even "Fun for all. All for fun." 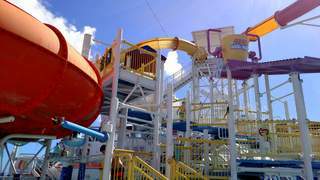 We spent six days in the Western Caribbean on the Carnival Breeze and witnessed firsthand just how much fun guests of all ages have on a Carnival cruise. We spoke with Jennifer De La Cruz, Carnival Cruise Line's Vice President of Corporate Communications about the Carnival focus. "We are the family cruise specialists with a family focus," De La Cruz told us. "We were founded in 1972 and created to make cruise vacations affordable and accessible to mainstream America. We are the come-as-you-are cruise line. We are the largest cruise line because we focus on mainstream America," she explained. 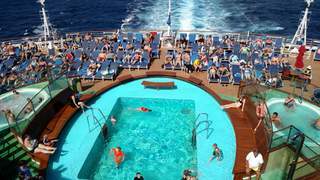 Our six day Western Caribbean on the Carnival Breeze began in Miami, Florida and journeyed to Falmouth, Jamaica, Georgetown, Grand Cayman, and Cozumel, Mexico. Since our cruise was part of the Carnival Live series, we were treated to a performance by comedian Kathy Griffin. We arrived in Falmouth, Jamaica and docked alongside the pier. This makes getting on and off the ship very easy. We were just a few steps away from a safe and secure shopping and entertainment area that included souvenir shops, Dairy Queen, Quiznos Subs, Nathan's Hot Dogs, Margaritaville, several jewelry shops and a swimming pool. A walkway leading to the security gate had signs on each side sharing the history of Jamaica. Guided tours are available to such Jamaica attractions as Bobsled Jamaica and Dunns River Falls, Seawinds Family All-Inclusive Beach Day, Zipline and Kayak, Bamboo Beach Club and Dunns River Falls, and the Chukka Horseback Ride and Swim. If you do decide to venture into town on your own, be prepared for very aggressive local taxi drivers, unidentified tour operators and scores of vendors offering everything from souvenirs to pharmaceuticals to prostitutes. Jamaica is Jamaica, after all. We dropped anchor just off the coast of Georgetown on Grand Cayman island. To get ashore, we had to board tenders. For first-time cruisers, this means that you must board a smaller boat and make your way to the shore in smaller groups. The port area is very modern, safe and is filled with souvenir shops and opportunities for food and adult beverages. Guided tours are available to such Grand Cayman attractions as Stingray Encounter and Turtle Swim, All-Inclusive Tiki Beach / Seven Mile Beach Getaway, Dolphin Swim and Stingray City, Coral Gardens and Stingray Sandbar, and Explore Cayman by Land and Sea. We chose to enjoy a visit to Stingray City to swim with stingrays and then a visit to a sea turtle farm to snorkel with sea turtles. Both were amazing experiences. We took a bus to a boat and then motored to the Stingray City area offshore and dropped anchor. Within seconds, dozens of stingrays both large and small swam toward our boat. 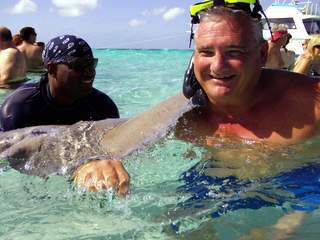 When we entered the water, the stingrays swim beside us, under us and between us. 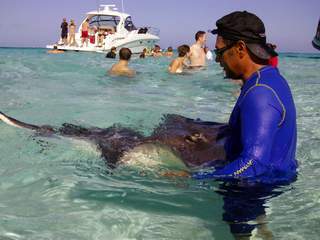 Whether you are snorkeling or just standing looking into the water, it is easy to reach out and pet a stingray as they swim past. Our guides showed us how to get a back massage from a stingray and even kiss a stingray for good luck. 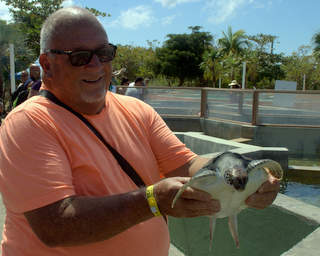 At the sea turtle farm, we enjoyed viewing the scores of large sea turtles playfully swimming just inside front entrance. We also had the opportunity to visit the pools where the young sea turtles swim. We were able to reach out and pick up the young turtles and they swam near. This made for a fantastic sensory experience and photo opportunity. One of the most enjoyable parts of our visit was the chance to snorkel with the sea turtles in a manmade lagoon. The turtles are so friendly that they swam alongside us at times as if to say hello. The turtle farm offers something very unusual for a tourist destination: Just outside its main souvenir shop is a second, smaller shop where every souvenir is only $5. We couldn't pass up the chance for a $5 Grand Cayman ball cap. They even threw in a free turtle necklace! We arrived in Cozumel, Mexico and docked alongside the pier. It was just a short walk through a souvenir shop to a safe and secure shopping and entertainment area. Be sure to look for local entertainers dressed as Mayan warriors. One group performs a fire dance for tips. Guided tours are available to such Cozumel attractions as All-Inclusive Passion Island by Power Catamaran, Ancient City of Tulum, Dolphin Swim and Ride with Unlimited Food and Drink, Deluxe Beach Catamaran Sail and Snorkel, and All-Inclusive Chankanaab Beach Day and Sea Lion Show. We chose to spend the morning at Chankanaab Adventure Beach Park. We were bused a short distance to the park in an air-conditioned van by our guide Javier. We were given an overview and tour of the park and then offered a buffet lunch and unlimited drinks for the day. For tequila lovers, Chankanaab Adventure Beach Park offers a tequila tour that shows the process necessary to make the popular Mexican alcoholic beverage. 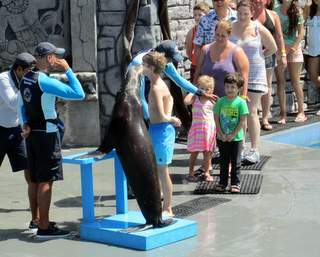 The park offers a cute Sea Lion Show several times a day in a comfortable amphitheater that gives guests the opportunity to have their photo taken with a sea lion. 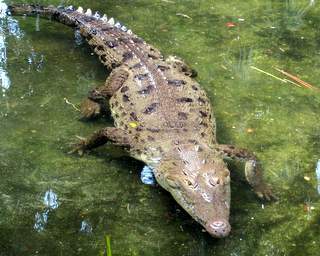 You can also swim with dolphins, go snorkeling, go diving, or view crocodiles and Mayan relic recreations. 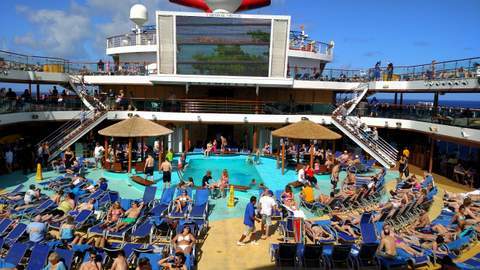 The beautiful Carnival Breeze is a $740 million, 1004 foot long vessel that can hold nearly 1400 crew and 4700 passengers. * WAREHOUSE Video Game Room. "We excel in family programs. We have over 700,000 children on our cruises each year. We offer multiple kids' programs. Our youth programs are very popular and give kids the opportunity to meet and get to know each other. We have a contract with Seuss Enterprises. Our Seuss At Sea program offers a lot of fun activities like the Seuss-A-Palooza parade," De La Cruz told us. We witnessed a Dr. Seuss Brunch ourselves and the room was filled with the smiling faces of the participating children. "We are very big on comedy. We provide both family and adult-only comedians. We have Vegas-like shows and a partnership with Hasbro Games where passengers can play classic Hasbro games big on stage," De La Cruz said. "Carnival Live started in 2014. Our goal was to attract fans of entertainers who might not otherwise cruise. Guests who purchase a VIP ticket get to attend a meet-and-greet with the entertainer and have a photo taken with the artist, " De La Cruz told us. On our cruise, the Carnival Live performer was Emmy and Grammy award-winning comedian Kathy Griffin. Her unique and often over-the-top stories delighted the audience of over 800. Other Carnival Live performers include Trace Adkins, K.C. and the Sunshine Band, Journey, REO Speedwagon, The Band Perry, Heart, Gladys Knight, Lionel Richie and Rascal Flats. We enjoyed delicious dinners in Cucina Del Capitano Italian Restaurant and the Fahrenheit 555 Steakhouse. They are both well worth the additional nominal fee. The service is excellent and the dishes we sampled were marvelous. Guy’s Burger Joint, created in conjunction with Food Network personality Guy Fieri, brings "all the authentic appeal of a roadside burger shack to Guy’s Burger Joint." If you enjoy hot burgers and hand-cut fries, this is something you'll definitely want to try. "Our outdoor activities are all about fun! We have ropes, courses, water slides and more," De La Cruz said. It is true! Both the young in age and the young at heart braved the towering waterslides, played basketball, mini golf and more. We enjoyed our Carnival Breeze 6 Day Western Caribbean Cruise. Once you get into the mindset of all for fun and fun for all, it's a breeze!